It's nice to have an excuse to write about UCONN on the weekend that their men's basketball team is playing in the Final Four. 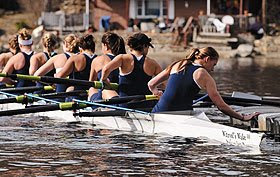 Rowing News Magazine told me, via Twitter, that the UCONN women’s rowing team is honoring a retiring UCONN Professor, Sam Witryol by naming their racing shell after him. The shell (that's rowing terminology for boat) is called Witryol’s Wake, Professor Sam. She (yup, even though it's named after a he, a boat is always a she) was christened with the new name at a UCONN men’s basketball game in December 2008, and will be rowed by the varsity rowing team this season. Full story from UCONN Advance Magazine.